Father Herman Lutz believes in using the gifts that God bestows upon us. Most of all, he believes that a Christian has a purpose in life. Even after retiring eight years ago, Father Lutz continues to spread the Good News of Jesus Christ wherever he goes. Ordained a priest in 1958, Father Lutz attended St. Anthony School and Cathedral High School, both in Indianapolis. After high school, he worked for an insurance company for a short time, but found the job unfulfilling. 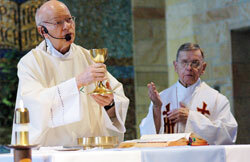 Prayer helped Father Lutz to realize his vocation. He discerned his call to the priesthood after spending two years at St. John’s College in Collegeville, Minn. There, he was able to explore the priesthood and, at the same time, be a regular college student. He later transferred to Saint Meinrad Seminary in southern Indiana to begin formal studies for the priesthood. Four years later, he completed his priestly formation at the Pontifical North American College in Rome. Recently, Father Lutz donated some outright gifts to the Catholic Community Foundation Inc. Outright gifts are gifts of cash, securities, real estate, insurance or personal property that can be restricted or unrestricted to defined ministries of the Church, depending on the donor’s wishes. In the process, Father Lutz gave a restricted gift—a gift designated to a specific ministry—for the Society for the Propagation of the Faith. Unrestricted gifts are applied to the ministry areas of greatest need. His generosity will reach people through missions of the Catholic Church in Africa, Asia and other remote areas of the world that await the Good News of Jesus Christ, who long to experience his hope and love. “There will be some people who will never hear the Gospels so we need to reach out to them,” Father Lutz said. Father Lutz also donated a restricted gift to the Bishop Simon Bruté College Seminary in Indianapolis. He recognizes that priests are at the heart of pastoral ministry, providing the life-giving care of the sacraments, prayer and spiritual direction. Father Lutz is keenly aware of the urgent need for pastoral leaders who can lead people to salvation through the Gospel. His generosity and commitment will help form new priests. “The Bishop Simon Bruté College Seminary is such a blessing,” Father Lutz said. He believes we need more priests to spread the Good News of Jesus Christ to bring salvation. Father Lutz noted that at the end of Jesus’ time on Earth, just before his Ascension, he told the Apostles: “Go, therefore, and make disciples of all nations, baptizing them in the name of the Father, and of the Son, and of the Holy Spirit, teaching them to observe all that I have commanded you” (Mt 28:19-20). His gifts to the Society for the Propagation of the Faith and the Bishop Simon Bruté College Seminary preserve our faith and create a legacy for future generations of Catholics. Father Lutz also continues to live his faith through the gift of his pastoral ministry. At age 78, he still celebrates Mass, anoints the sick and hears confessions for the residents of St. Paul Hermitage, a retirement and nursing home facility in Beech Grove operated by the Sisters of St. Benedict of the adjacent Our Lady of Grace Monastery. He also provides the sacraments to 40 to 50 Catholics at the Altenheim, a retirement facility in Indianapolis, who look to him for spiritual direction. The Catholic Community Foundation has many options to support the work of the Church, and financially help the people that we serve. If given the opportunity, most of us would like to leave a lasting legacy to the ministries that mean the most to us. Through more tax-favored ways of giving, more of us can experience the joy of making a difference. If you would like more information or are interested in a confidential conversation regarding your planning goals, contact Ellen Brunner, director of planned giving, Catholic Community Foundation, Office of Stewardship and Development, at 800-382-9836, ext. 1427, or 317-236-1427 or e-mail her at ebrunner@archindy.org.